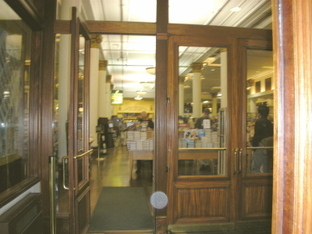 We were unhappy to read in Racked and The New York Post that the Chelsea location of Barnes and Noble will not be renewing their lease in May. It is hard to believe that the store is not profitable. Nearly every time I've gone there, I've had to wait in a long line and there are usually five or six cashiers--even at nine or ten on a Tuesday night. It's more likely that the store can not afford the new rent. This is bad for the entire community. Chelsea used to be home to scads of used, new, foreign language and even Communist bookstores. Small businesses are an endangered species. Even this giant bookstore chain can't survive here. Glass towers are destroying their habitats. What kind of person would spend hundreds of thousands (or even millions) of dollars to live in an urban area without a decent bookstore in the neighborhood? With all of the rising rents, Chelsea is becoming an arid land. This is a bummer. That store was one of the best things about the area. I can understand, though, if a combination of rising rents and competition from online sales (including their own) is making it hard for brick-and-mortar bookstores to be viable. I was pretty surprised to read that the Astor Place Barnes & Noble is going to become a David Barton gym. I love gyms, but I consider that a step backwards for the area. It's getting to the point that with all the rising real estate value in Manhattan ALL the low-profit retail will have to go out of business. Then we will just have one big Rodeo Drive with no other amenities and we will all have to move out.